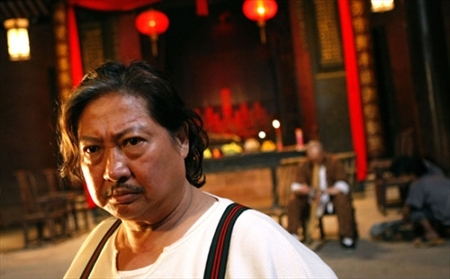 Sammo Hung returns to our screens in this film shot in 2009 just before he started work on Ip Man 2 ,And the one thing from this is you can see the portly kicker as we all know him (though he may be slightly heavier then normal). The reason i mention this is if you look at the teaser trailer for Ip Man 2 you will notice Sammo slightly thinner then normal ,this was due to his heart problems at the start of filming Ip Man 2. Any way here we are for this alternative take on Kung Fu ,we have had Shaolin Soccer,Kung Fu Dunk and Kung Fu Mahjong now it's the Chefs turn . What makes this interesting is Sammo is keen on food ,not just because of his size but he likes to cook from what i have heard. So it is fitting that Sammo would make a film like this where he plays a a Chef (Wong Ping Yee) who falls foul of his Nephew Wong Kai Joe ,who has great resentment to wards his Uncle as he blames him for his Father's (Wong Ping Kei) running away after a fight between them. Now the film opens up where Ping Yee is catering for a Banquet with his staff ,but all goes wrong when the Pork they are cooking is overdone by neglect of Ping Yee's junior ,in a attempt to salvage the party Ping Yee uses the only thing he can to get the party Started,yes it's the Dragon Head Clever and with this he prepares a a pig for the kings to eat ,the only problem is even this brilliant feast is sabotaged when everybody falls ill and Ping Yee is blamed and shunned away. Unbeknown to him it was all a plot put together by his Nephew to ruin him. Shooting off to another plot where young Ken''ichi'' Lung Kin Yat (Vanness Wu) is a pupil at a Martial arts come cooking school and on Graduation leaves to find his way .Now what happens is both these loners end up at the Four Seas restaurant where Ping Yee's brother was once the head Chef.The restaurant is not doing so well as Wong Kai Joe's own restaurant seems to take most of the business . The two enter for meals by themselves and Ping Yee orders a dish that is not of the region for the Restaurant ,when the Chef decides to take the challenge and the dish is served Ping Yee Scrutinizes it and comments where it could be better whilst this is going on Ken''ichi'' is looking on. The restaurant is run by a young woman and her sister along with there Chef ,what happens now is a showdown of cooking as the the Chef sets a challenge and Ping Yee accepts providing the young Gentlemen Ken''ichi'' assists him. Basically Ping Yee thrashes them with his culinary skills and the Chef leaves in awe of it all. Now without a Chef the restaurant is doomed and upon finding out who Ping Yee is they ask him to help.He agrees with the help of Ken''ichi'' to assist who now wants to be Ping Yee's disciple. The film builds up to what is a cooking contest for the Top Chefs ,when Ping Yee's nephew hears that his uncle is the new Chef at the restaurant he is not pleased and sets about getting even with him and at the same time stopping them from entering the contest which his restaurant has won for the last few years. It is from this point that the film plays host to some classic set pieces ,not just in the Kung Fu stakes but also the training stakes as a Chef as well ,never before has watching some one cook been so much fun (and your want to eat whilst watching this) .Along with some good battles Sammo shows he is still the man ,even though for a couple of shots he is doubled for some flipping and somersaulting moments. I never will understand Sammo was never one for Gymnastics in the old days ,why when some one else directs him do they insist on having moves that he would not do,he never did.But apart from this it is a joy to see Sammo giving it large in front of the camera . Then we have Vanness Wu who gives a good show as a fighter (considering he is a pop star and Dancer first and foremost) Some of the scenes with Fan Sui Wong (remember this was the young boy from Above the Law) are blinding and a treat for your eyes ,whilst the rest of the film is a treat for your stomach. So was it any good ,in one world YES. Even though shot on a budget the film is fun and the cast give a sense that it was fun to make ,and i wholeheartedly recommend it's viewing and if you like Sammo it's a must.